What a stark contrast from Marrakech where you find the chain on the horizon of the High Atlas. If the proximity of the Sahara’s hard to make us imagine a country of mountains and snow, Morocco is the most mountainous countries of North Africa.Since the high peaks, where the view is superb, steep slopes and corridors received,the field is well suited to the practice of ski touring. Arrival at the airport, reception and transfer to the village of Imlil and Me Zik, 1800 m above sea level. Dinner and overnight lodging. From the village of M’zik to reach the Tizi Mzik (2464 m) passing through pine forests, juniper and pine of Aleppo. Lunch in the mountains, then a cross on the mountainside, we will join the folds of Azib Tamsoult (2100 m) then the Epiney refuge at 3000 m. The comfort of the shelter is fairly rudimentary, but the site is superb as the peaks of Ouanoukrim and Tazarhart to over 4000 m. This is surely the most beautiful mountain huts! Elevation: 1624 + m – 364 m.
Mounted on top of Biguinoussène to 4002 m in the valley of Timler, then a little steep valley to the summit. Descent is by the row Tadat either by the same route. Many routes are from the refuge and we will choose the best according to the shape of the participants and their level of skiing. From the hut, climb to Tizi Melloul to 3800 m. It will cross a small lock with skis on the bag, then put together a beautiful valley dominated by the jagged peaks of AFEL, the Akioud, and Ouanoukrim. Southern slopes downhill to the valley of Ouanoukrim, then increased back to the wild valley to Tizi n’Ouanoukrim 3965 m.The neck is a beautiful lookout on the summit of Toubkal and its satellites as well as the Anti-Atlas in the south. A beautiful valley will take us back to the Neltner refuge to 3207 m after a ski descent of beauty. 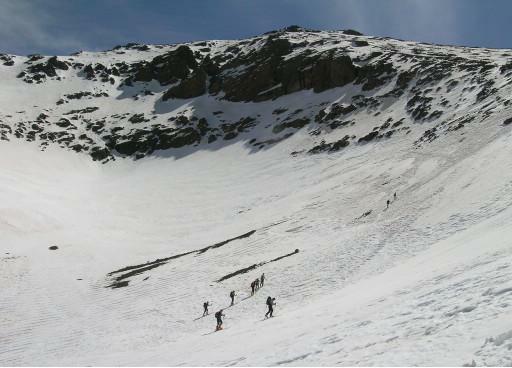 Elevation: 1500 + m – 1250 m.
Ascent of Toubkal, the highest point in North Africa, at 4167 m. We go up the first steep climb with crampons, and depending on the quality of the snow, we will finish the climb on skis. The summit ridge is the skis back on the bag. Still a magnificent panorama of the peaks of the Atlas. To the north there is the Middle Atlas and Moulouya south, the Anti-Atlas and the desert to the dune Merzougha. Descend the north ridge with crampons or skis, for very good skiers, and then we go down the pass leading to the beautiful valley under the Neltner refuge. 1000 m of turns of beauty! Descent Sidi Chamkarouch (2310 m) and back to Imlil. A local shuttle vehicle will take us by the new road to the village of Tachdirte where the lodging.Tachdirte night. Altitude: + 960 m – 1857 m.
Early morning we leave for the summit of which rises to Iguenouane 3882 m, probably one of the best races of the ski area. The rise is in a groove a little narrow and steep at first, then the valley opens to make way for large slopes superb.Panoramic Ifraouane and chain n’Darn Adrar. Descent by the beautiful valley north and return to the village of Tachdirte. Night at the inhabitant. Altitude: 1600 m – 1600 m.
Another beautiful hike, as we climb to Tizi Likemt to 3555 m. The valley is dominated by the rocky ridges of towering peaks of the Aksoual. The ski descent to the village of Tachedirt (2310 m) is no particular difficulty. In the village, we find our transport back to Imlil. Change of vehicle to return to Marrakech. Overnight at the Riad Dar Saad in the Medina. Gradients combined: + 1 600 m – 2000 m.
Free Breakfast and visit the city and transfer to airport for departure. NB: This program may be modified depending on snow conditions or if the group prefers to stay longer at a particular location. – Transport on arrival and departure from Marrakech airport and the hotel. – Transfer by car from Marrakech and the starting point of the trek and back. – 01 night half board in Marrakech at the Hotel 3 ***. – 06 at the lodge or homestay during the trek. – Full board during the trek. – Equipment of camping and cooking. .
– Mule 01 for two people (carrying luggage & foods). – Lunch in town and during transfers. – Tips and personal expenses. Depending on demand and are secured at the base of a participant. Estimates are studied in more accurate, they vary according to the following criteria: (low or high season, the scheduled visits, transportation, length of stay, number of participants). Temperature: 10 ° to 15 ° Day & 3° to 8° at night. Raid technically somewhat difficult with moderately steep snow slopes at 35/40 ° C maximum. We advise you to have a good physical condition since the steps are generally quite long, with elevations of 1200 m per day on average. We climb at a pace of 350m/heure in general. Good skiers from everywhere: You spend whatever snow and whatever your style, you control the conversion swallows. You are able to go down a black run with a pack of 8 pounds. Short excerpts possible need to walk with crampons. You’ve already practiced ski tours. Only the bag for the day. There will be a mule for two to carry food and baggage of the group. For a guide assisted by a French Moroccan cook and muleteers. Limit the weight of your luggage, your travel bag must contain all of your business.Instead, take a soft travel bag with side openings or backpack without a frame, avoid rigid bags and suitcases. – Touring skis light, equipped with suitable fasteners, or straps with safety brakes, and maintained with a sole (fed and waxed regularly). – Plush (seal skins) adapted to the shape of the ski and not too worn with a proper sizing. – Knives fasteners suitable for very hard for snow and ice. – Ski Poles (telescopic or not) with large washers. – Ski boots hiking shoes with removable inner soles and Vibram. In case of leasing, test them and protect effectively the areas of friction on the day of departure. – Bib mountain gaiters incorporated. – Goretex Overtrousers if your overalls is not hot enough. – A pair of lightweight studs. – Individual equipment safety: Arva, shovel and probe. It is customary to tip the team who accompanied you during your stay. Depending on the satisfaction that you withdraw from the team, it is reasonable to tip minimum of 15 € per hiker. This amount is collected in several envelopes that you give to the guide, the cook and muleteers. It is generally customary to tip most important guide and the cook and then to the mule.